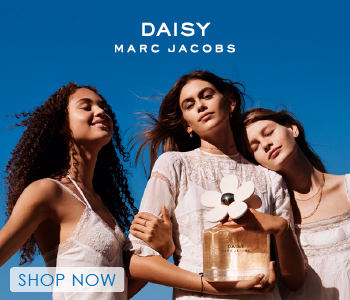 Let the sunshine in with the iconic Daisy fragrance from Marc Jacobs. Marc Jacobs Daisy is a secret refuge. It's a hideaway. It transports you to a place that is free spirited, happy and sunny. Regardless of age, Daisy reminds you to be open and experience life's many possibilities. Daisy captures a youthful spirit, a compulsive smile. Experience a luscious and natural freshness with top notes of Wild strawberry, Violet Leaves and Ruby Red Grapefruit. A luminous heart of Violet, Jasmine and Gardenia exudes a feeling of modern vintage.Smoothness and warm sensuality is provided by base notes of Vanilla Infusion, Musks and White woods.